Sensei John began studying Isshinryu in 1974. His wife Cindy began in 1977. They studied from Jim Canter who was a Ni Dan at the time. 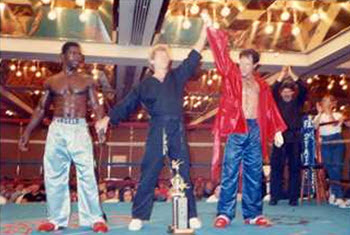 Jim learned from Willie Adams in Detroit then moved to Florida and opened a dojo. At that time they were with the A.O.K.A. During this period, John attended two A.O.K.A. Functions and Cindy attended one. Before Jim Canter retired from teaching karate he took 2 of his black belts (one of them being John) to Georgia to get promoted to Ni Dan. That is when John first met Sensei Harold Mitchum. Sensei Mitchum looked at the two of them do kata and then promoted Jim Canter so that he could promote his own students. Jim retired soon after and John and Cindy took over the school (which had about 15 students). They had a lawn service in New Port Richey, Florida where they mowed about 80 lawns a week by themselves and then worked out and taught karate in the evenings. They took their two daughters with them and one of their daughters, Sheri, went on to get her black belt and is presently a Roku Dan and owner of Ingram’s Karate. After a while John and Cindy were having a hard time keeping up with the lawn service because the recreation center where they taught had grown to over 100 students. They taught many children as well as adults. They decided that something had to go - and it would not be teaching Isshinryu! They opened a second school in Palm Harbor, Florida which ran full time and presently has 300 students. The recreation center dojo in New Port Richey was moved to a full time facility and now has over 200 students. Over the years the Ingrams and their students have been involved in open karate tournaments all over the country winning many state championships and national rankings. During the '80's John decided that he wanted to try kickboxing. He hooked up with world rated fighter Mike Hollobaugh along with world class trainer Bill Slinker. He loved the challenge and competed and trained students to compete for the next 10 years or so. During that time he trained with the sport's best, such as world champions Jerry Clarke, Richard Hill and Jim Graden. He did exhibition bouts with two World Champions: Bill "Superfoot" Wallace and Jerry "Sting" Clarke. He also fought a Professional Boxing Champion who wanted to try kickboxing. After the fight, the boxer decided to stick with boxing. While John was pursuing a career in kickboxing, Cindy was making her mark as a National caliber point fighter. In 1989 she won the Diamond Nationals and the U.S. Open and finished second at the Battle of Atlanta. For her efforts, she was named N.A.S.K.A. Rookie of the Year. Something happened in 1986 that changed their direction. They heard about an Isshinryu Seminar being held in Cartersville, Georgia. It was a U.I.K.A. seminar led by Harold Mitchum. Since Sensei John had been on his own for many years he decided to see what the seminar had to offer. He participated in the seminar and saw Sensei Mitchum perform kata, and even more importantly, bunkai, and came back to Florida with a whole different attitude about kata. Sensei John described the experience as follows: "I had in all my tournament experience never seen anyone do kata like Harold Mitchum. I was impressed by the deep understanding this man had for kata application and karate in general. I came back with the knowledge that I was doing a lot of things wrong. Having no guidance for many years even though we worked out very hard, caused us to deviate from tradition. We never realized it. We always thought we were traditional. Compared to the other open tournament practitioners we were. " For many years to come they learned from Sensei Harold Mitchum and went back and taught their students. Not only did their kata and understanding of Isshinryu improve, the students started winning the open tournaments in kata - not just fighting. 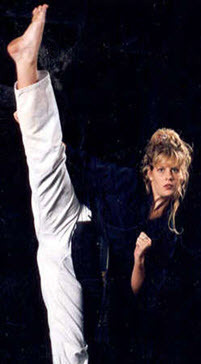 Sensei Cindy, who had only been top rated in fighting, went on to become the State Champion in kata and in weapons. In both of these divisions she competed against men - She was the only woman. Now John and Cindy have resigned their positions on the Florida open tournament circuit and train their students to do good traditional karate. They, along with Sheri and Jennifer Davenport , train them to participate in AAU tournaments. These tournaments use international rules and work hard to stay with traditional values and technique. Several students come home each year with gold medals at both the Junior Olympics and the National Championships as well as International Competitions! 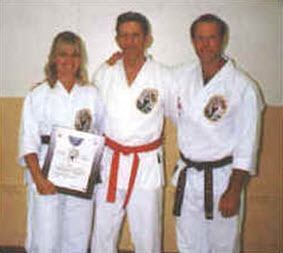 John and Cindy's oldest daughter, Sheri Ingram Angwin now runs Ingram’s Karate center along with life long Ingram’s student and instructor Jennifer Davenport. 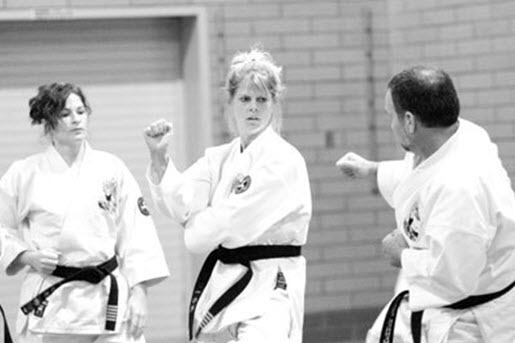 Sensei Sheri has been practicing Isshinryu Karate since 1982 and is currently a 6th degree black belt.Sensei Sheri competed on the U.S. fighting team who defeated England in 1993.She took 3rd place in the Isshinryu World Championships in Kata in 1997.Sheri won the GOLD medal at the 2000 AAU National Karate Championships.More recently, she was chosen to be on the U.S. team to compete at the World Championships in Scotland. The team was comprised of the top 5 women and 9 men from all over the United States.Sensei Sheri then went on to win the GOLD medal in fighting at the 2001 National Championships in New Orleans - making it the second year in a row as the National Champion in the Women's Lightweight Division! Sensei Sheri is Florida’s Regional AAU Referee. Sensei Sheri is currently the chief instructor at the Tampa dojo. Jennifer Davenport is a 6th degree black belt who has been studying Isshinryu since 1984. She has won Florida State championships in sport karate. She also won second place in the 1997 Isshinryu Grand Nationals held in New York. She took the gold medal at the Okinawan World Championships in 2001. Jennifer was the U.I.K.A. instructor of the year in 2004. She won National titles in both 2008 and 2010. Jennifer is a certified coach and referee for the AAU. She has been instructing at Ingram's Professional Karate Center since 1990 and loves working with children. Sensei Jennifer is currently the chief instructor at the New Port Richey dojo. Both Sensei Sheri and Sensei Jen endeavor to teach their students that being a good martial artist is being a good example for others - both inside and outside karate class. These individuals along with many others, have made great advances for Isshinryu Karate, as well as making Ingram's Professional Karate Center a name synonymous with quality.